This recipe is one of the top five most delicious foods I've ever eaten. I cannot even describe how good it is! It's super rich, so a very small portion is filling--which is good, because it probably has a million grams of fat in it and at least a trillion calories. Totally worth every single gnocchi. The original recipe can be found here. This is my slightly-modified version. Cook gnocchi according to package directions, and then run under cold water to stop cooking and prevent sticking. In a sauce pan, melt the butter over medium heat. Sauté the garlic in the butter until the garlic is soft (be patient—don’t crank up the heat and burn it!). Add the cream and increase the heat to medium-high. Bring just to a boil, stirring constantly. Reduce the heat to low, and add the parmesan cheese, pesto, salt, and pepper. Allow the sauce to simmer for a few more minutes. Once the sauce has thickened a little, add the gnocchi and stir gently until covered in sauce. Makes 4-5 servings. *Don't try to make this low in fat. I mean, you can, but it just won't be the same. I ate this as I was losing weight by counting calories, and it never made me gain weight. Just enjoy the richness of it. If you want to make it healthier, just eat a smaller portion and have a salad with it. *You may want to hold off on adding salt until the end. The Parmesan cheese adds a lot of salt. I happen to love salt, so I added some; but some may find it too salty if you season while cooking. *I love the simplicity of this dish, and I honestly don't think it needs anything more! The garlic and basil in cream is heavenly enough. 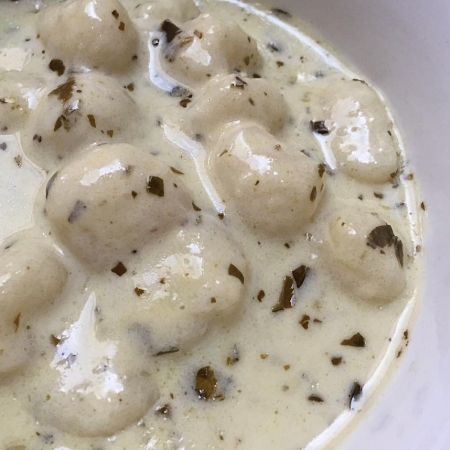 Okay, I HAVE To try this -- I love all things Gnocchi and this just seems so yummy! Yum!! I can't wait to try this. Thanks so much for sharing. I know we don't have any pesto in the house, do you think it would be okay to substitute some baby spinach? I know it won't be the same......Just do NOT want to stop by the supermarket! Made this tonight and it was sooooooo good! And insanely easy.